Become a TRi KiDS Sponsor! The SunRype TRi KiDS Triathlon Series offers various opportunities to be involved in our unique race series. By partnering with TRi KiDS you are contributing to the continued growth of this first-class event series and supporting our efforts to encourage kids to lead healthy, active lives. If you would like more information on our local and national partnership opportunities please contact us by email. 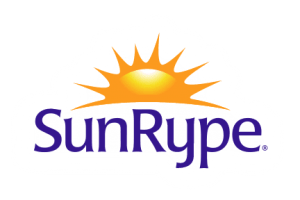 Since 1946, SunRype has been providing families with delicious juices and fruit snacks. SunRype is committed to helping Canadians make good choices that offer both great taste and wholesome goodness. Visit SunRype’s website for healthy recipes, tips for feeding picky kids and new products.